F1 Night with K1 Speed & Alpinestars! Come join K1 Speed and Alpinestars for an evening of celebration as we welcome the 2013 Formula 1 season. Alpinestars will be showing the race live from Australia on their 26 foot outdoor screen along with activities, raffles, cars, food, music and more. 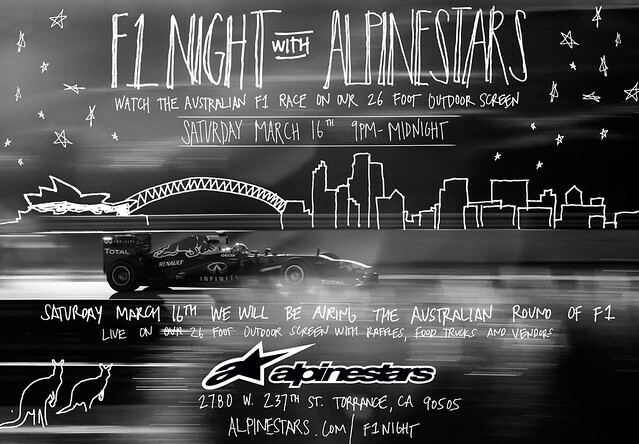 Saturday March 16th, 9PM – Midnight at Alpinestars HQ in Torrance.